It’s that time of year again. No, not just the holiday season, but also the time when you realize that the year is ending and taxes are just around the corner. This year is particularly difficult because Congress still hasn’t decided what to do about the Bush-era tax cuts (the Senate will vote on Obama tax-cut proposal today, but the House Democrats have indicated that they reject the deal in its current form). The uncertainty makes it especially difficult to decide what actions to take to reduce or defer tax before 2011 arrives. However, there are still strategies that will make the decision making easier. Since there is a good chance that taxes will be higher in 2011 than in 2010, you may want to decide whether to accelerate your income to take advantage of known tax rates. If this is the route you choose to take, here are some things you can do. If your employer pays bonuses, ask if they can be paid this year instead of next year. Do you have stocks that you can sell for capital gains? This is particularly a good move if the Obama tax-cut deal doesn’t become law before year end because capital gains are taxed at a lower 15% this year (despite the uncertainty, the chance of passage is actually pretty good due to the compromise in the proposal). If you want to take advantage of current tax rates, go ahead and sell them now. Of course, you always want to consider the market condition and whether selling your holdings now meet your long term investment strategies. While you might be saving on taxes, you may also be cutting future income and jeopardizing your retirement. Speaking of retirement funds, now is a good time to convert your traditional IRA or old 401(K) into a Roth IRA. Then you can decide how to report the income. If you are sticking with the strategy to have more income now, report the income on 2010 taxes. If, on the other hand, you are trying to minimize your income, report the income on the 2011 tax forms. On the other hand, if you choose to try minimizing your income for lower taxes, your decisions will be very different from the above. For example, instead of asking for the 2010 bonus this year, you may want to ask your employer to wait until 2011 to pay out the bonus money so it won’t appear on your 2010 tax bill. And rather than selling stocks right now, you’ll want to hang on to them. If you’re eligible for an IRA deductions but can wait until 2011, do so. Now on to the subject of deductions. Once again, things will be a lot easier if the proposed tax cut goes through. If you want to increase your deductions this year, here are some things to consider. First, pay all deductible expenses such as medical bills, make charitable donations, pay your property tax. Second, if you have any investments that have lost value, consider selling them now and taking the loss on your tax bill. Finally, increase contribution to your retirement fund, be it IRA or 401(k), to the maximum amounts allowed. The other road is to decrease your deductions based on what you and/or your financial adviser think what Congress will do. In that case, obviously, you’ll want to defer paying off the medical bills, making charitable contributions, and you’ll hang on to loser investments. You’ll leave your payments to your retirement fund the same. And one strategy that works over time regardless of the tax code is itemized deductions. If your itemized deductions are close to the standard deduction, consider bunching them and only claiming them every other year. This can save you a bundle over a long period of time. Finally a word about the Alternative Minimum Tax (AMT). If you are affected by AMT this tax, there are some things you’ll want to consider as you formulate your tax plan going forward. Because the AMT reduces or eliminates the tax breaks for things like paying medical bills, it’s better to just pay them as they come due. It is also wise to sell any stock options as they will be added to your calculated income and will affect the AMT. The future of the AMT is still unsure, but it it is likely that more people will be affected by it in the coming year. 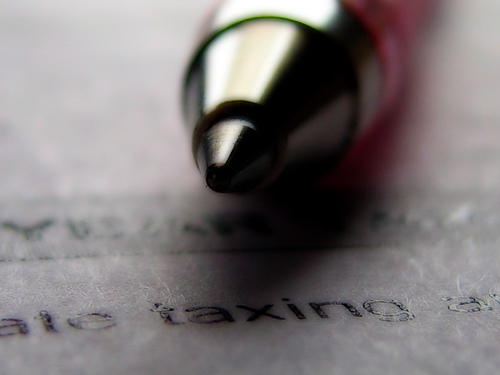 There are some tax breaks that will end after 2010 so take advantage of them while you can. The $1,500 Energy Efficient Home Improvement deduction for making your home more energy efficient is available this year only. Similarly, the credit for buying a hybrid car is also a one time deal. This is the last year that the child tax credit is $1,000 per child. After this year, the tax credit goes down to $500. Long term capital gains tax will almost certainly go up from the current maximum of 15%. These are just a few ideas to help you save on your taxes. For more information, consult your financial planner.